23 September 1962, before it was simplified. Definitely not a picture for the faint-hearted or sensitive aesthetes! No.307 at the most northerly point on the system [Cosham] on Sunday 30 December 1962, after 14 inches [355mm] of snowfall. No.304 crossing Guildhall Square 1 January 1963 after another 115mm of snow had fallen. No.233 is making the U-turn, but this was rather special, as Friday 21 June 1963 was the last time any trolleybus would turn here, as the 17/18 service would come off the following day, and with it, trolleybus No.233. The U-turn completed, No.233 is now stuck in traffic at the junction of Park Road and Guildhall Square. [Friday 21 June 1963]. No.233 and No.300 in Park Road near the Guildhall on the gloomy Wednesday 13 February 1963. No.233 is overtaking No.300, which has dropped its booms to let it pass: No.300 would subsequently make a U-turn on the Park Road short-working. No.246 and No.248 at a scrap yard near Portsmouth gasworks on Monday 9 September 1963. 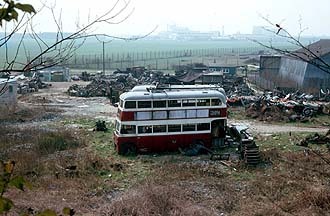 Today the trolleybuses, dog, scrap yard and even the [coal] gasworks are all long gone. No.315 in Western Parade, bouncing over long-abandoned tram tracks and passing a Southdown PD3 bus. It was taken on Tuesday 23 July 1963. 283 in Highland Road, Eastney, on 6 April 62. 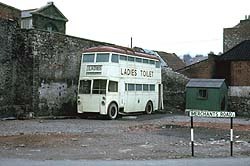 #258 [RV9109] Withdrawn in October 1952 and later sold to the City of Bristol Transport & Cleansing Department and converted to a mobile Ladies Convenience. Photographed on 29 April 1965 at Merchants Row. 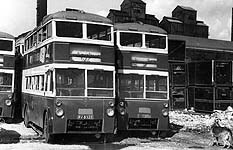 Trolleys 231 and 282 [behind] at Southern Counties Demolition, at Hilsea near the former Portsmouth Airport on 7 April 1964. 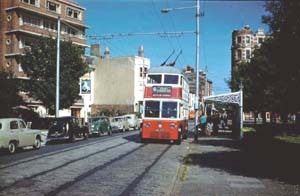 Taken on Southsea Terrace when tram tracks still remained in place. 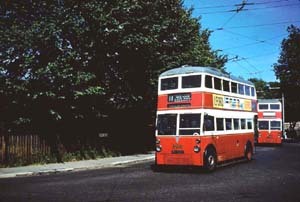 The trolleybus is a BUT/Burlingham vehicle and appears to be 310. This picture is just around the corner from my own image on Western Parade [also with tracks in situ]. The scene remains almost unchanged today, save that trolley wires, tram rails and the splendid bus shelter have all gone, although the last-mentioned may be one that has merely been moved to a site on the seafront, less than half a mile away. 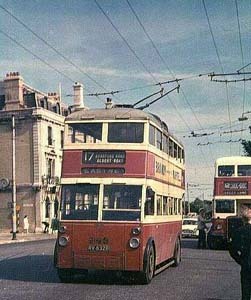 Two westbound trolleybuses, led by EE/AEC/Cravens vehicle 282 on Park Road near its junction with St. George's Road. This scene has hardly altered, although the naval shore establishment HMS Vernon [behind the photographer] is now the Gunwharf Quays discount shopping centre. 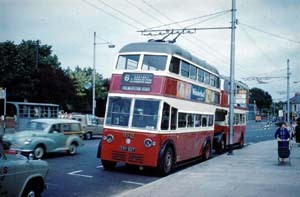 BUT/Burlingham trolleybus 315 at Cosham Red Lion terminus. 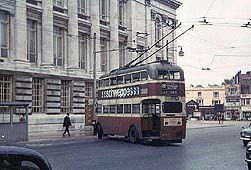 No 315 was the newest trolleybus built for Portsmouth. 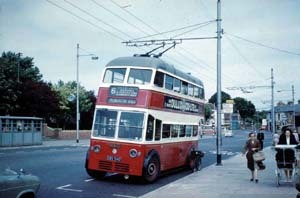 Also taken at Cosham Red Lion, BUT/Burlingham trolleybus 312. Copnor Road, just aproaching Copnor Bridge. 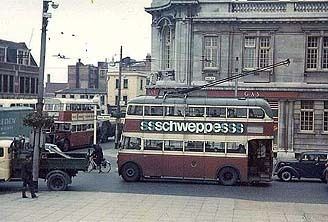 The building at the back of the trolleybus is The Sportsman public house. #258 [RV9109] Withdrawn in October 1952 and later sold to the City of Bristol Transport & Cleansing Department and converted to a mobile Ladies Convenience for use in the area. More information on this trolleybus. Portsmouth Museums & Records Service On display at the Milestones Museum in Basingstoke.